When it comes to working with soft materials in the world of DIY, we’re quite experienced indeed with different types of fabrics and materials. Every once in a while, however, we find ourselves itching to learn something new, challenging ourselves to sew or create using a material that has different properties and requires different techniques than what we’re used to. That’s precisely how we found ourselves browsing through the leather and faux leather sections of our local fabric store during our last visit, wondering how we might make small, awesome things that will add a bit of the traditional looking, good-smelling classic material into our lives. There’s just something about leather that reminds us of fall and durability, so we were intent to start using it the moment the idea struck us! Working with a new material is always a learning curve, though, so we were also intent on finding good, clear tutorials that could give us some guidance and help us get started. 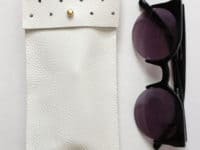 Have you actually hesitated in buying yourself a large portion of leather to work with because you’ve never tried it before and you’re not sure how it’ll go or if you’ll want to do it again, so you’re looking for something to make with a very little piece? 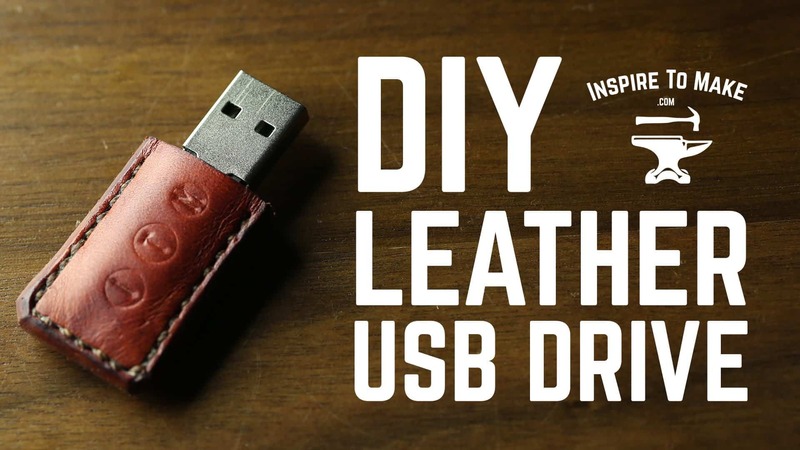 Well, if you’re the kind of person who ever finds use for a USB drive, like we often do, then we think this tutorial from Inspire to Make that shows you how to make a vintage looking little USB drive case might be right up your alley! If you’re going to teach yourself about working with a new material, then we think it’s a good idea to try something with a very simple shape that only requires straight forward sewing and stitching. That’s why we thought this leather iPad case, outlined nice and clearly on Wholefully, was such a good idea! It only requires straight lines and simple seaming, and only one three sides, so it’s a great opportunity to learn about tension on your machine and what cutting and sewing leather feels like. 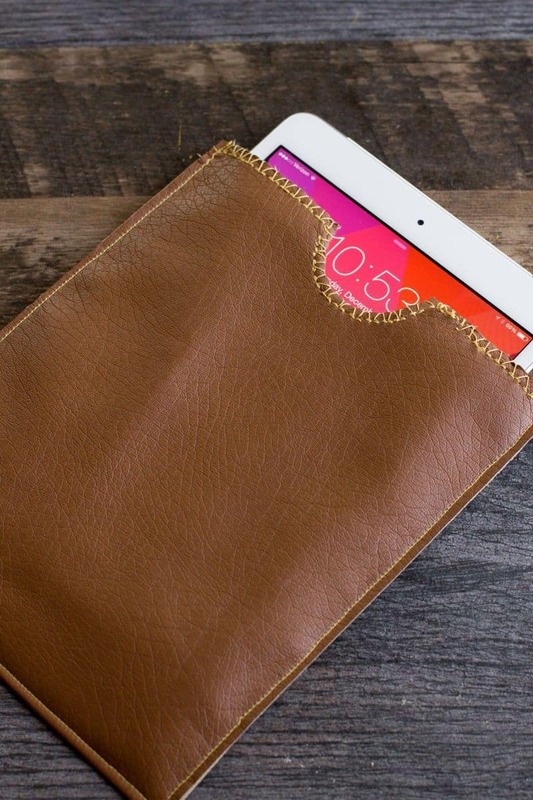 The soft underside of the leather will also be gentle on your technology’s smooth screen. 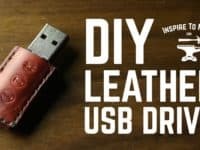 Were you very intrigued indeed by the idea of using small scraps of leather, perhaps upcycled from something store bought that you already owned but no longer use, to make yourself something new and small, but you just don’t use USB keys enough to warrant making the idea we showed you earlier on our list? Then perhaps you’d get more use out of something like this durable little leather key holder features on Duram instead! They show you how to make a fastening loop so you can hook your keys to your wallet or belt loop, depending on how easy access you need to keep them. 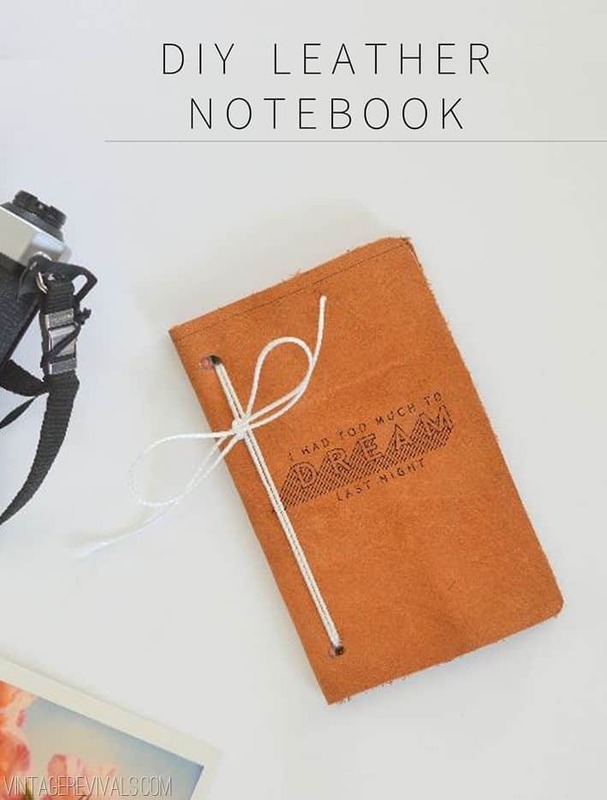 Have you always been an avid sketcher, or perhaps a motivated journal keeper, but you have trouble finding pre-made notebooks in stores that really speak to you aesthetically and make you feel drawn towards filling their pages with your creative work? Then maybe you’d feel better about working inside a book that you made all by yourself, with your own two hands! 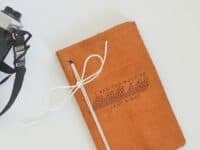 We certainly agree that quality leather notebooks are harder to come by in stores, which is why we were so pleased to stumble upon this tutorial for a DIY one on Vintage Revivals. 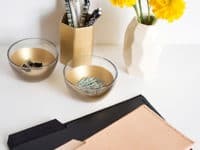 Whether you prefer the idea because you’re a green enthusiast who loves to help the environment stay more waste free however you possibly can, or whether you’re just intrigued by the idea and the aesthetic, we think anyone keen to work with leather should take a look at how these DIY leather file folders were made! 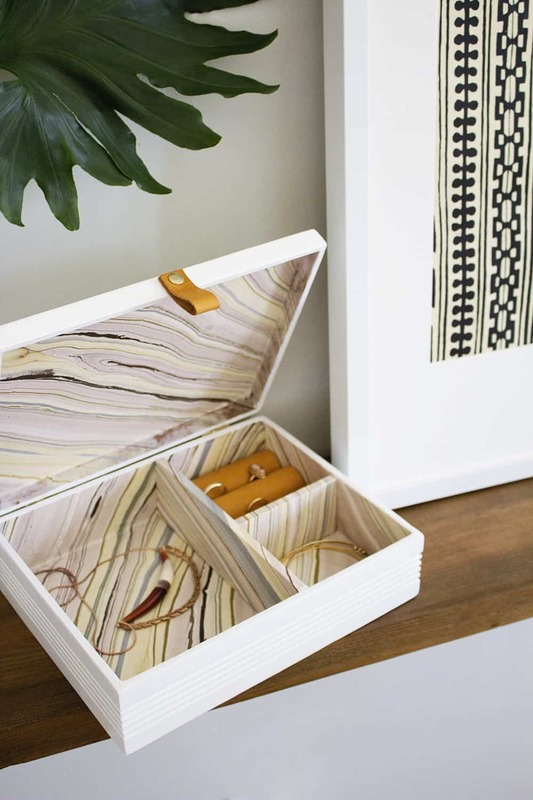 The House That Lars Built shows you how to cute and stitch them neatly so you have a durable, classic looking place to put your most important papers in order to help you stay organized. 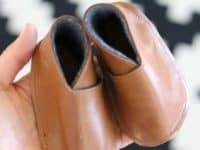 Just in case you’re still all about the old fashioned properties of leather but it’s not you or the other adults in your life that you had in mind, here’s a project that’s for the little ones in your life! Believe it or not, leather styles things are great to have from a really young age because they’re warm and durable. 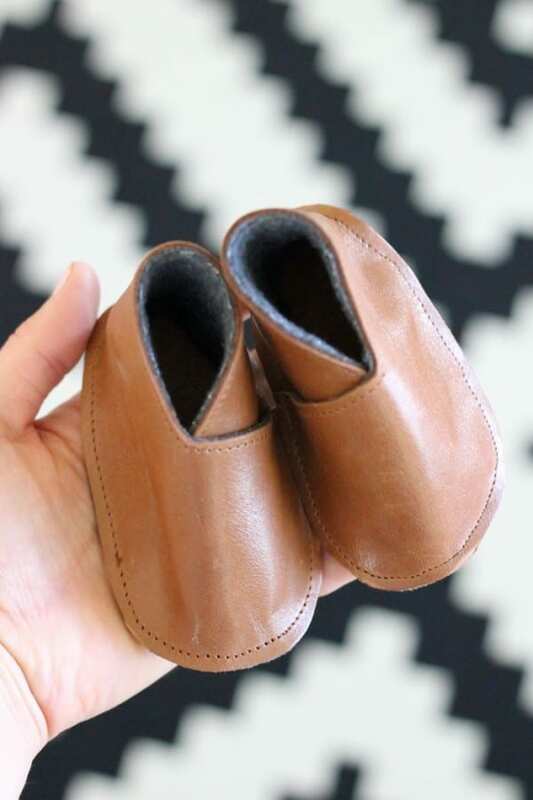 That’s why we thought these lovely little old fashioned looking homemade leather baby booties, outlined step by step on Delia Creates, were such a good idea. 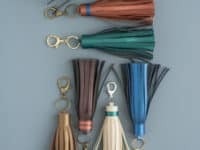 Are you actually such a leather lover that you can help wondering whether you might incorporate it into your personal style in a unique way, but you’ve also been thinking a lot about whether sewn and stitched projects are your only options when it comes to working with the thick material? Then we think you might be pleased to learn that they actually are not and that many DIY leather jewelry pieces not only exist, but are created in other ways! 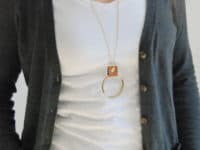 We’d definitely suggest taking a look at this lovely leather and gold hoop necklace tutorial featured on North Story to see what we mean. 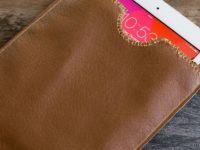 Just in case you’re still looking for alternative leather projects that don’t involve sewing, then maybe you’d prefer one that uses leather like a liner, letting its soft outside and durability keep things that are delicate and precious to you safe? 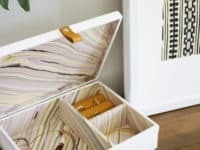 In that case, we have a feeling you’ll get along very well indeed with this leather lined jewelry box tutorial featured on Anna Bode. Our favourite part isn’t actually the fact that the leather is used as a lining, but rather the fact that they teach you how to marble painted your leather first, which is something we’ve never tried before! Are you actually still thinking about different ways to use leather in more unique fashions but the characteristic about it that has always intrigued you the most is definitely the strength of the material? Well, why not make something that harnesses that quality in a cool, visually appealing and practical way? 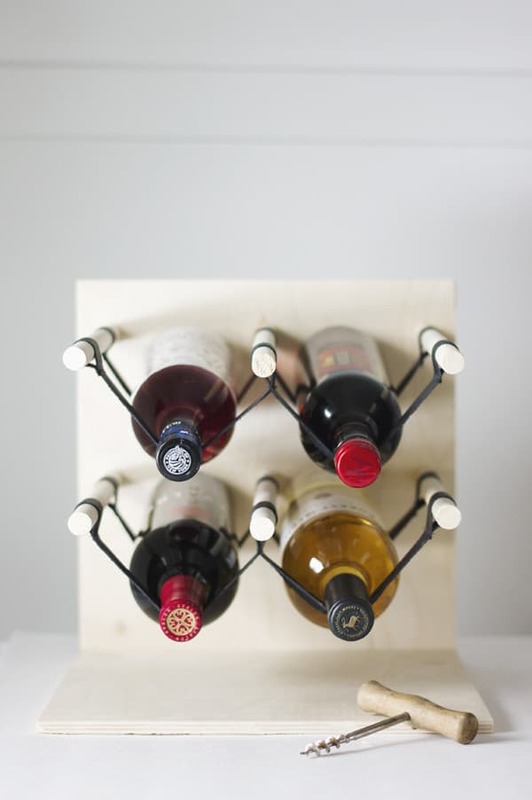 If you’ve ever been any kind of wine enthusiast or drinker, we’d absolutely suggest taking a look at how The Merry Thought made this awesome free standing wine wrack from wood that features leather straps strung between the pegs to support and cradle the bottles. 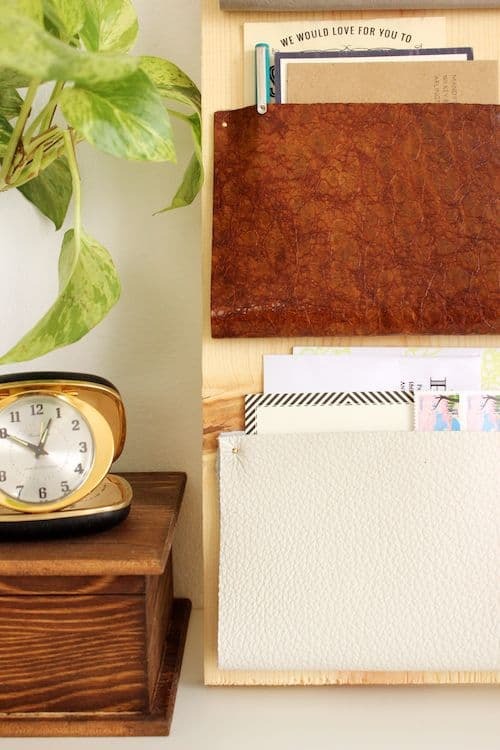 Were you quite intrigued indeed in the leather file folders idea that we showed you earlier on, but you’re either concerned that you’ll lose loose files or you’d like to take that idea one step further and make yourself a whole matching leather organizational system? 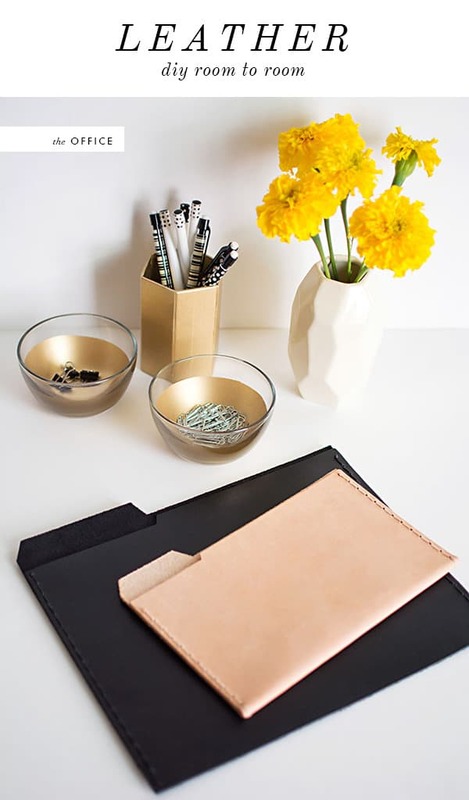 In either case, we’d urge you to take a look at how Design Sponge used, once more, the stunning combination of wood and leather to create a desk organizer that features accessible leather pockets for storing papers like invoices until you need to reach for them. 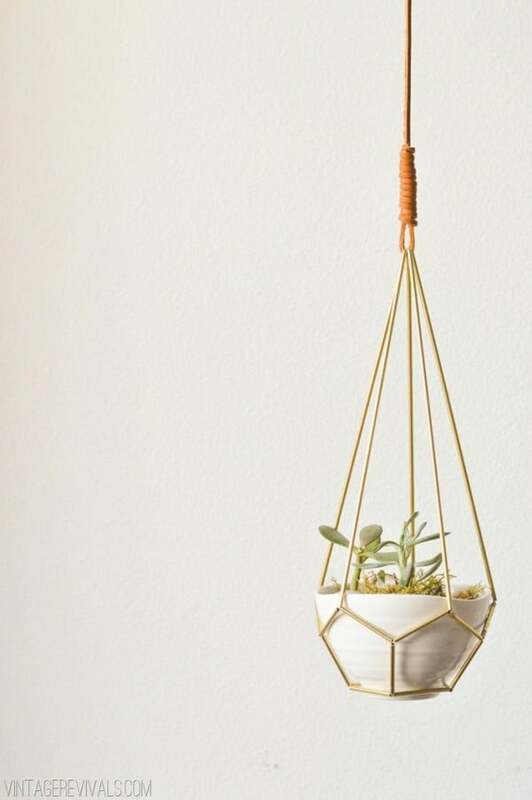 When you’re not working with fabrics and materials, does most of your DIY and decor world actually revolve around the lovely plants you’ve covered your home in and how you display them? 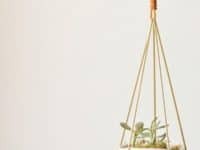 In that case, we think your patience and continuous scrolling is about to pay off in this awesome plant hanger tutorial from Vintage Revivals! They show you how to make it from gold wire and thin leather strips. Now, just because you’re working with leather doesn’t mean you have to stick within the spectrum of classic neutrals like black and brown. One visit to a quality fabric store will tell you that there are actually plenty of creatively coloured leathers out there for you to choose from! 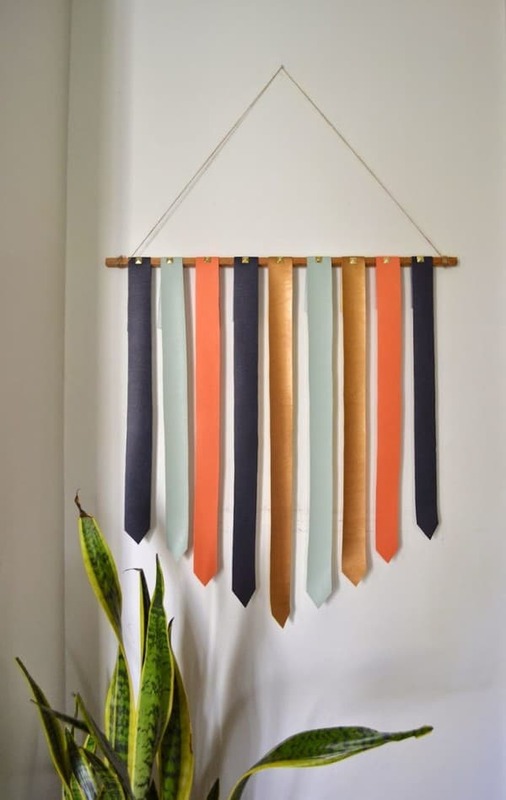 Just in case you’d rather get a little bit brighter about your leather craft, here’s a wonderful coloured leather strip wall hanging project outlined step by step on Design Post Interiors for you to try. Now, we’ve talked a lot about sewing leather thus far in our list, and we’ve also talked a little bit about projects that don’t require you to sew your leather at all, but what if you’re intent on making a leather project that would classically be sewn… only you’ve never used a sewing machine before? 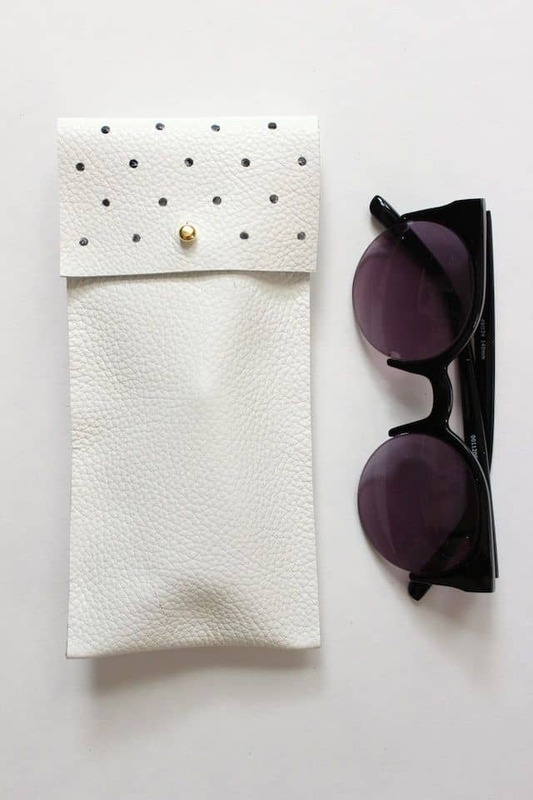 In that case, we’d absolutely suggest taking a look at how See Kate Sew made this fantastic protective leather sunglasses case without creating a single stitch, even though the one’s you’ve seen in stores that are similar probably have seamed edges. 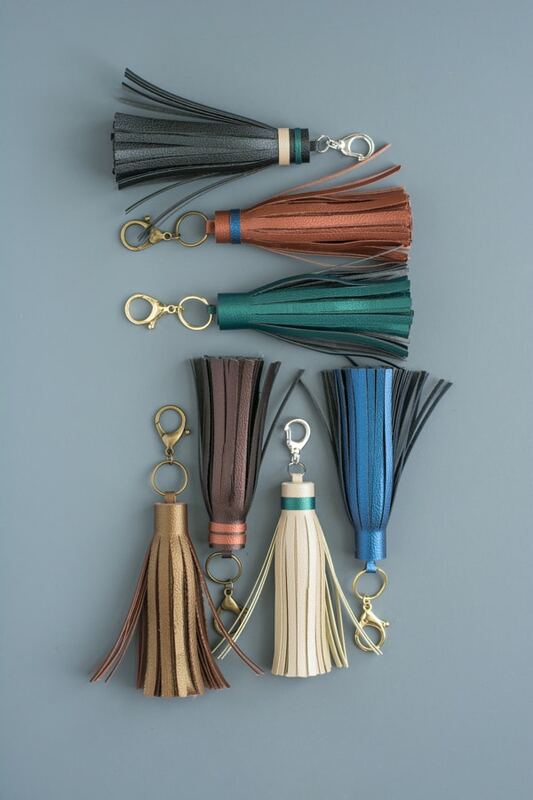 Are you actually still scrolling through our list but finding yourself thinking back over and over again to the idea that had you working with a leather accessory for your keys, but you’ve hesitated because you’re just not sure that a fastening ring is really something you’ll use? Then maybe you’d rather just make yourself a decorative keychain instead! We love the way Design Moms created a simply cute fringe piece by wrapping layers of leather, gluing it in place, and cutting strips to look like fun, funky fringe. 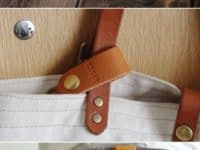 Have you made other types of leather DIY projects that you were very happy with but that you don’t see here on our list, even though you love suggestion them to people? Tell us all about what you made and how you did it or link us to photos of your finished work in the comments section! 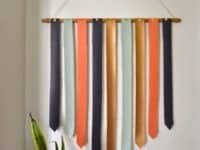 The post Sophisticated Panache: Awesome Projects Made From Leather appeared first on WonderfulDIY.